E22A South Tacoma Shops, July 1960. In the 1930s, with train tonnage increasing, the Milwaukee began assembling boxcab motors, creating two -unit locomotives, classified as EF-1. E22A was converted to EF-1 in 1939 to E22A+B. Twenty-four such combinations were assembled. E22A+B, as well as her sister E23A+B, were converted to passenger service as class EP-1A in 1954. 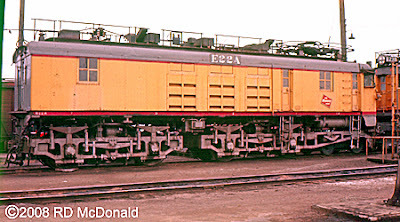 She was fitted out with a rounded "streamlined" cab front, and repainted with the Union Pacific Railroad paint scheme of Armour Yellow with Harbor Mist Gray roofs, and red dividing lines. When the Olympian was discontinued in 1961, it was returned to freight service, as an EF-1. I had a chance to ride an EF-1 monster from Black River Junction to VanAsselt Yard, and was struck by the definite lack of space in the cab, the noise of blowers, groaning of gear sets, and the smell of electricity – ozone. It is interesting to note that the original freight motors had a top speed of 35 mph. Going faster resulted in the armatures flying apart! Installing high strength steel bands to hold the armatures together and other motor improvements allowed the top speed of 45 mph in the 50’s! Take a close look at the undercarriage of E23A; the articulated undercarriage of these locomotives was a wonder to behold – a combination of coil springs, leaf springs, equalizers, connectors. There was some engineering to connect the carriages to the body, and insure an “in-line” pull when juice was applied! Drawing 3,000 volts DC from the overhead trolley, one hour overload ratings for the GE Motor was 123% of horsepower (3,000 x 2 units) and 132% tractive effort, compared to an F-7 85% and 102%. So they were well suited for the Cascades and Pipestone! 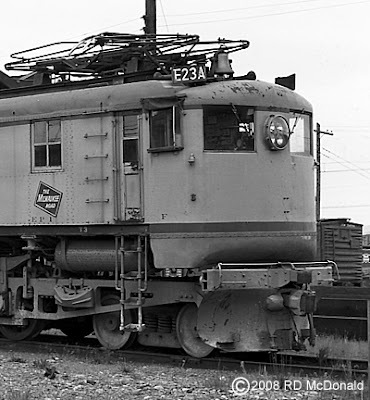 Railroad Stuff: Milw E22A, ALCo - GE Class EP-1, 2 x 3,000 hp per unit, built ALCo-GE 1916. Began life as 10103A, 4/26/16. Finally became E22A, 2/12/53. Retired, 1968. Scrapped, 1973. Renumbering information courtesy of Sy Reich, Milwaukee Road Motive Power Roster, Railroad Magazine, October 1960.